Today, on September 28th, 2011, during Amazon press conference in New York, Jeff Bezos has announced several new versions of the Kindle Device: Kindle Touch, Kindle Fire and Kindle 4 mini. Will have a 6″ latest generation eInk. There will be no keyboard, not even page flipping buttons, with all features accessible via “easy reach” system touch interface. Touchscreen uses the same infrared technology as latest generation Sony eReaders. Kindle Touch is made of silver plastic (again similar to latest Sony eReaders). It will be available on November 21st with pre-orders starting today in two flavors – WiFi only for less than a $100.00 (!!!!) -$99 and 3G for $149. Amazon is pretty consistent with charging $50 for “lifetime unlimited 3G access available in over 100 countries”. It seems like the software has gotten an upgrade as well with the new X-Ray feature that lets you do rich text lookups that go beyond looking up single words in the dictionary. It seems to pull Wikipedia description of general concepts mentioned on the page you are currently reading. Available: November 21st with pre-orders starting today. Same 6″ screen, but no touch, no keyboard, only with page flipping buttons. Because of this the device is both very compact and inexpensive. 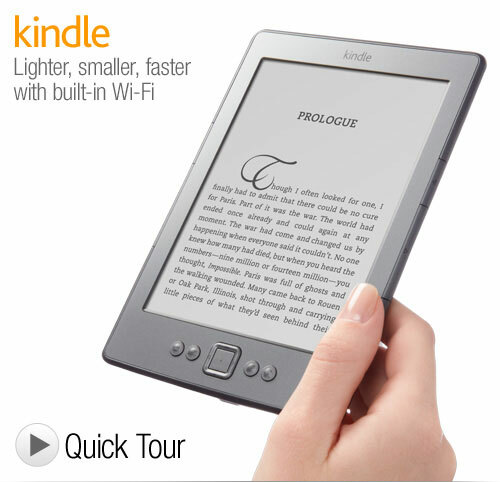 It is 18 smaller than Kindle 3 and weights under 6 ounces. Priced at only $79 with Special Offers and $109 without and shipping today. 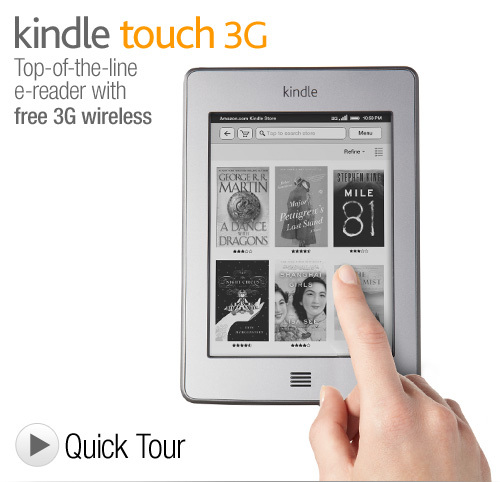 The device is actually called just “Kindle”, with Kindle 3 being creatively renamed into “Kindle Keyboard”. LCD is protected with extra-strong Gorilla-glass. Amazon’s own Android app store. Kindle Fire seems to rely heavily on Amazon Cloud Storage. Same WhisperSync technology that synchronizes book reading position across multiple devices now works with movies and TV shows – it automatically remembers last watched position. You can resume watching the movie on your TiVo or any other Amazon-connected streaming video device. Touch UI supports swipe gestures to bring out extra controls, very similar to Windows 8 concept. It looks nothing like vanilla Android. Homescreen features 3D carousel of most recently accessed content regardless of it’s type: in the demo Angry Birds game is shown right next to the latest issue of Vanity Fair magazine and Kindle eBooks. OS supports multitasking. So you can listen to music while you are reading a book. You can pin any kind of content (including a website bookmark) to your Home screen bookshelf. Full color magazine display seems to be much smoother than with original version of Nook Color. Price point is $199 as was previously announced. This includes 30-day trial of Amazon Prime service that normally sells as $79/year subscription. 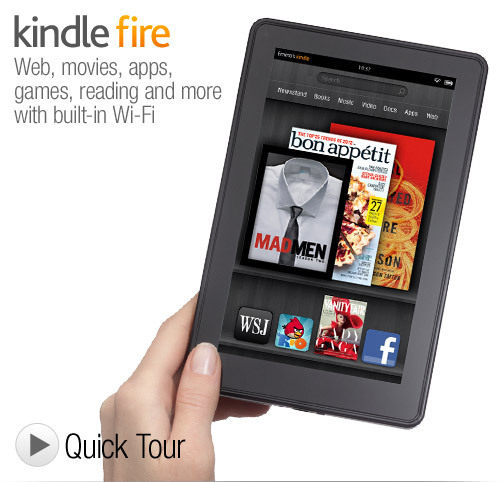 Kindle Fire ships on November 15th, 2011 with pre-orders starting today. One month trial of Amazon Prime. Availability: Ships on November 15, 2011. Pre-orders available now. I’ve added these new devices to the eReader Size Comparison page. So now you can visually compare how they stack. Kindle Mini is smaller than Sony PRS-350 while featuring same buttons and screen size. Kindle Touch is smaller than Nook Color again while featuring the same screen diagonal. This entry was posted in Kindle 3, Kindle 4, Kindle Color, Kindle Fire, Kindle Keyboard, Kindle News, Kindle Tablet, Kindle Touch and tagged amazon prime, kindle 4, Kindle Fire, Kindle Keyboard, Kindle Silk, kindle tablet, kindle touch, Shelfari, touchscreen by Dzmitry. Bookmark the permalink. These are great devices. Just hope everyone lays off the “ipad killer” references as none of these compete with the ipad as far as horsepower goes. What about a new Kindle DX!!!??? I don’t want color or to play Angry Birds!!! I want eink with BETTER pdf support!! I really don’t know anymore. I lost my hope on a new DX. I will have to consider other big screen eReaders like the PocketBook or alike. Too bad Amazon doesn’t care for the academic public. I’m so disappointed by the lack of 3G on the Kindle Fire. I had my credit card in hand but once I read here that I decided that I’m going to stick with my 2nd gen Kindle 3G until I can get anywhere access. If I could get a DX with the updates software of the kindle 3 and wifi I would bbuy it immediately. the lack of a software update for the kindle 2 and kindle DX is very annoying, especially since there are third-party hacks that will let you copy the software from a kindle 3 to a 2 or DX. Kindle — Does one thing, and does it well: Allows you to read text comfortably. Not so great: Photos, graphical material, flipping through pages. Fire — Great graphics & speed. Text not as easy on the eyes as e-ink. Soo… Visualize a book-cover that holds both a Kindle and a Fire, side-by-side, or back-to-back. Both have Wi-Fi, and they are configured to talk to each other. I buy a book, and it is present on both. A synchronizing app gives me the ability to have the graphics – photos, maps, diagrams, charts, graphs, equations, whatever – presented on the Fire, the text on the Kindle. I touch the text, “See Figure 1” on the Kindle, and Figure 1 shows up on the Fire. Now when I’m reading the Saxon Chronicles, I can actually see the map showing me where Mercia and Wessex were! Likewise, if I am browsing the New York Times on my Fire, and come to a lengthy article I’d like to read, I can select it and send it to the Kindle side, as with the “Readability” app that is currently available. I can do most of this now (but not the “See Fig. 1” part), but wouldn’t it be great to have one app to sync the whole thing? Today, almost of the students are getting benefit from this web site and it could be more helpful for all the people. I would like to say thanks for given valuable article on here. I got a new kindle fire how do i get it set up ? Kindle Fire has just a few setup options and is ready to use it from the box.